Of all the extras that can be bought to make more of a PC, the humble printer is probably the most popular. But that humility might conceal a house guest that costs much more to run than most people realise. While the device may be very cheap to buy initially, especially if bought at the same time as its companion PC, the running costs can, and do, mount up. Particularly if a printer is used to produce a lot of high-quality colour copies. 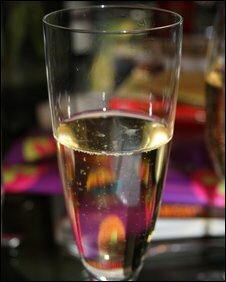 It is well known that printer ink costs more per millilitre than the finest champagne. And it is in the costs of the ink that manufacturers claw back what they lose every time a printer is sold. Lizzy Russles, a computer expert at consumer organisation Which? counsels people to look at a printer's long-term running costs. 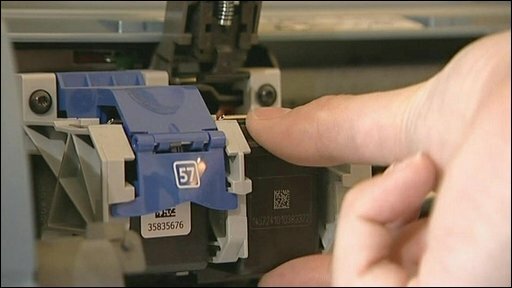 The cheaper a printer, she warns, the sooner its cartridges were likely to need replacing and the higher the ongoing costs. The problem most people face when trying to gauge how economical their printer is with that very expensive ink is that the machine is not very good at working out when all the ink is gone. 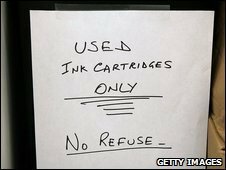 An investigation by the BBC found that some inkjet cartridges have their ink contained in a sponge rather than free flowing - as a result the machine has to estimate when the ink is drying up rather than use a defined level like in a car fuel tank. "It's not our intention to have any sort of scam involved with this," says Martin Hurren, business development manager for HP Supplies. "A lot of it is down to technology - different technology is used with different cartridges." Many printers err on the side of caution and warn when the cartridge is getting empty. There are good technical reasons for this because printer heads can be damaged if they run completely dry. "Some of the technology we use requires ink to remain in the cartridge so that the printer head can have a fluid motion and allow ink to pass through the printer when you change the cartridge," says Mr Hurren. However, the internet is dotted with stories about people who have ignored the warnings from their printer and gone on to print many, many more pages before the cartridge gives up the ghost. But, says Mr Hurren, it was hard to compare one person's experience with another because of the range of things printers can turn out. "The number of pages varies depending on the way you print, photos are different to business documents," he says. "With our cartridges you can get anything from 200 - 2000 pages." What also complicates matters is that some makes of printers have cartridges that are tagged with ID chips. The printer notes which ones are in use as it is printing. When one runs out and an owner tries to trick the machine by slipping the same one back in to get more pages, the printer will refuse because it thinks that cartridge is empty. These identification systems are also used in larger office printers. However, it is possible to trick the printer in thinking an older cartridge is new. In some models the memory reserved for the tags can only hold a couple of ID numbers so swapping in totally empty ones will clear out the cache so the one with ink remaining can be replaced. It is also possible to buy chip resetters for some makes of cartridge so the printer is totally fooled into thinking that an old one is new. Ms Russles from Which says it is definitely worthwhile investigating the running costs of a printer before buying one. She said it was probably worth avoiding cartridges that combine all colours in one package. This is because when one colour runs out, perhaps cyan after printing out holiday snaps, the whole thing has to be replaced. A study by Epson carried out in 2007 found that up to 60% of ink in a cartridge goes to waste. The tests, carried out by the TUV Rheinland research group, tested printers that use multi-ink cartridges and found there was a lot of waste when one colour runs dry. The fact that many desktop inkjet printers hold their ink in a sponge means that they are eminently refillable. In most cases peeling off the label on the top of the cartridge reveals handy holes where fresh ink can be squeezed in. But, warns Ms Russles, this is not for everyone. The results can vary, not all models of printer allow their cartridges to be refilled and it can be very messy if something goes wrong. One alternative is a continuous ink system that, as its name implies, constantly pipes ink to the cartridge so it never runs out. This, says Ms Russles, has a following online but is not for the fainthearted or technical novice.